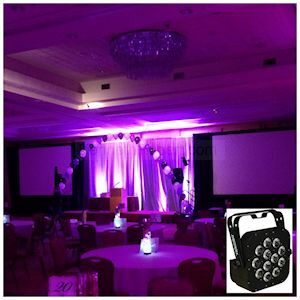 We provide a variety of Event Lighting services for your corporate, wedding or special event, including Sales, long and short term Rentals, Design, Installation, Service and Operation. From basic dance floor lighting to intelligent lighting, like the High Tech Scanners and Moving Heads you see in clubs. 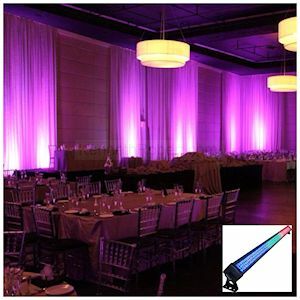 Décor uplighting to outdoor String Lights, we can custom design lighting options and schemes while keeping your project, event or wedding on time and on budget. 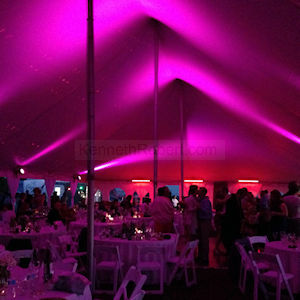 We've got the right lighting effects for your special event! contact us today to request a complimentary design Consultation, Quote or Site inspection! 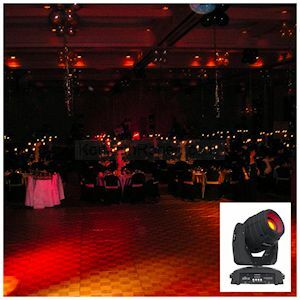 Ballroom (house) lighting is not considered event lighting and is never designed as an adequate light source for dance floor activity. In addition, full effect lighting will make a dance floor appear more inviting and will help create excitement or a pulse that might not have otherwise existed. High energy and good dance music can be complimented by different types of high-tech professional lighting effects that sweep across the dance floor, creating the perfect blend of visual energy, colour and excitement that make a tasteful and first class look on the dance floor. Not having lighting on your dance floor is like not having a centre piece on your table! Lighting is an important element in room décor. It not only highlights the surroundings, but also enables us to perceive color and texture, accent or highlight area’s you would like to enhance or draw attention to, or hide flaws you would like to remain unnoticed. 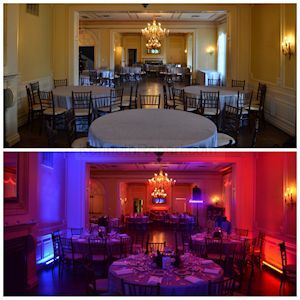 You've spent time selecting the right venue, now use lighting to maximize its impact. From large scale corporate galas to intimate engagements and weddings, let us provide you with some general guidelines about creating lighting schemes and supply you with ideas that will enhance the impact of your next event. LED Parcan's are great for washing walls with colour, used as up-lighting they can change the look of any room. Great for corporate events, weddings, fashion show runways, stages and so much more. LED Bars are great for washing walls with colour, used as up-lighting they can change the look of any room. Great for fashion show runways and Stages and so much more. The LED Quad 12's are a super bright fixture that produces a smooth 25 degree beam consisting of 12 x 5 watt LED's with superior Lenses. Great for larger (taller) rooms and works well as stage wash. 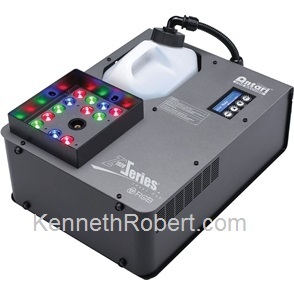 LED Quads are DMX Programmable or can be set to Auto or Sound to Light or just be one static colour. RGBAW Fixtures have more colour's than ever before! Great for any size Tent no matter what your event. need String Lighting? We can Help! 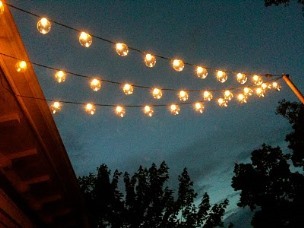 Event Lighting rentals specializing in String Lighting for your Tent, Patio Backyard or any outdoor Event. We deliver set-up and test all our Lighting rentals for your peace of mind! A laser lighting display or laser light show involves the use of laser light to entertain an audience. A laser light show may consist only of projected laser beams set to music, or may accompany another form of entertainment and lighting effects, typically a concert or other musical performance. Laser lighting is useful in entertainment because the coherent nature of laser light causes a narrow beam to be produced. This allows the use of optical scanning to draw patterns or images on walls, ceilings or other surfaces including theatrical smoke and fog without refocusing for the differences in distance, as is common with video projection. This inherently more focused beam is also extremely visible, and is often used as a special effect. Sometimes the beams are "bounced" to different positions with mirrors to create laser sculptures. 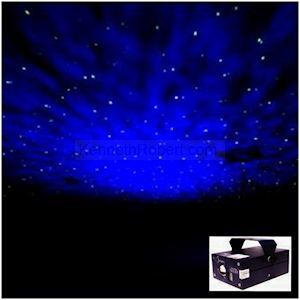 This Special effect Laser creates a Star field & Nebula effect on the ceiling , walls, and floor. Watch thousands of moving pin-points of green light dance in pattern on a soft blue nebula cloud. It's truly amazing to see such a compact projector produce such an enormous amount of light. it's like dancing under the stars! Pin Spot lights are great for highlighting your centre piece or focal points in the room. These pin spots are recommended for beams up to 20'+ and can accept an assortment of color lenses. Also includes a mounting bracket. This will definitely be a hit at your next event. Pin Spot lamps project swirling streams of light that reflect off the mirror ball and onto your floor, walls, and ceiling, generating a spectacular array of light and sense of movement. For an even more profound effect, use our fogger to highlight every beam of light. 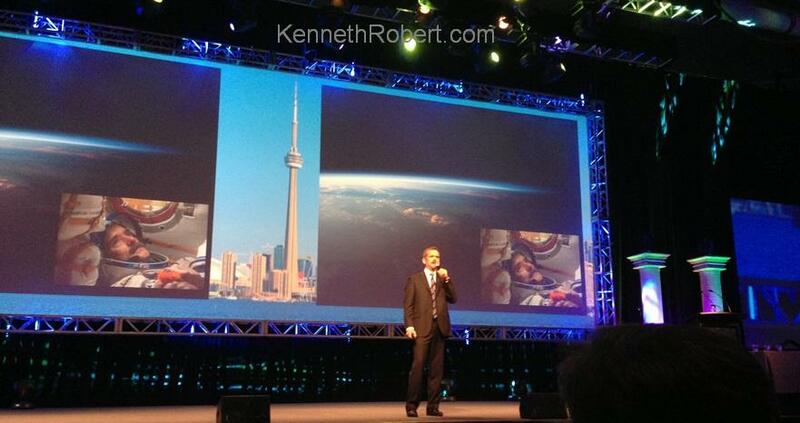 Add a red, blue, green, or yellow lens filter or gel to change the colour of the beam from the Pin Spot light. In addition to Fog and Pyrotechnics the Black Light or UV (ultra-violet) Light is a popular effect for your Halloween Party or other Themed event. 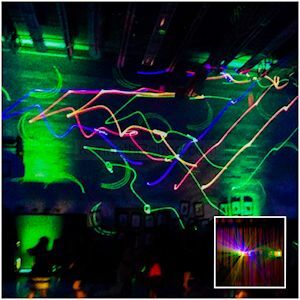 Often used at school dances as a dance floor effect the black light works well at creating a "glow in the dark" effect when incorporating neon party favours and clothes. Also great for fashion and art shows. 400watts of pure ultraviolet light with minimal "blue glow" yet maximum effect. 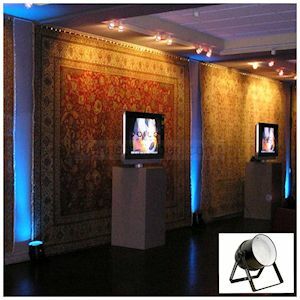 these Black Lights are best used in larger spaces where maximum coverage is required. 40 inches of pure ultraviolet light with minimal power consumption yet maximum effect. These Black Lights are best used in most spaces where good coverage is required. Our most Popular Black Light. A fog machine (also called a smoke machine) is a device which emits a dense vapor that appears similar to fog or smoke. This artificial fog or smoke is known as Theatrical Smoke and Fog within the entertainment industry. Most fog machines create the fog by either vaporizing a water and glycol-based or glycerin-based fluid or a mineral-oil-based fog via atomization. For glycol-based fogs, the fluid (fog juice) is injected into a heated block, and evaporates quickly. The resulting pressure forces the vapor out of the exit. Upon coming into contact with cool outside air the vapor forms a fog or smoke, and greatly enhances the effect of specialty lighting (laser lights, intelligent lighting, etc..). Some fog machines use Dry Ice to produce a fog of carbon dioxide. Also called haze generators or hazers, are taking over the job of fog generators for highlighting lighting or laser effects. Haze machines are often used with bands and bigger venues when a lighting effect may need to be visible in the air. 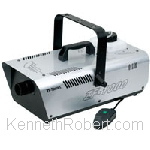 For the purpose of visibility of light beams sometimes a haze machine or fog machine is used. The difference between the two is that the fog itself is also a visual effect. Awesome effect with smoke and light often used with bands and bigger venues when a lighting effect may need to be visible in the air. Perfect for the Grand Entrance at Weddings! A fog machine (also called a smoke machine) is a device which emits a dense vapor that appears similar to fog or smoke. This artificial fog or smoke is known as Theatrical Smoke and Fog within the entertainment industry. Most fog machines create the fog by either vaporizing a water and glycol-based via atomization. This fluid (Low Lying fog juice) is injected into a heated block, and evaporates quickly. The resulting pressure forces the vapor into the chiller. Upon coming into contact with the cold ice, the vapor forms a low lying fog or smoke. 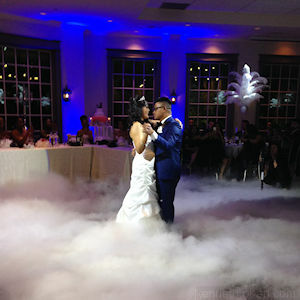 A great effect often seen at weddings during the Bride and Grooms first dance to simulate dancing on a cloud. NOTE - This machine uses regular Ice to produce a Low Lying fog very similar to the Dry Ice Machine, however, this effect will last longer and can be repeated often as compared to the Dry Ice Machine which can not. Remember Dry Ice is hard to find, very expensive to buy, and is dangerous to handle! Dry ice is the genericized trademark for solid carbon dioxide. It is commonly used as a versatile cooling agent. Dry ice sublimes, changing directly to a gas at atmospheric pressure. The low temperature and direct sublimation to a gas makes dry ice a very effective coolant and special effect, since it is colder than ice and leaves no moisture as it changes state. Due to the extreme cold nature of dry ice, it should only be handled by an experienced professional. When dry ice is placed in water, sublimation is accelerated, and low-sinking dense clouds of fog are created. This is used in Dry Ice Machines at theaters, nightclubs and special events for dramatic effects, often seen at weddings during the Bride and Grooms first dance to simulate dancing on a cloud.